I don’t always notice how much time is passing until it’s gone. The days all seem to blur together and before I know it four years has gone by seemingly in the blink of an eye. I had such a feeling this morning when I checked my Timehop before work as is my usual routine. Today’s gems from years past included pictures from a Disney vacation from two years ago where my Disney sister, Monique, and I were participating in the runDisney Expedition Everest 5K Challenge. And then I kept scrolling and came across a photo that I wanted to share on my Facebook as a then and now comparission. 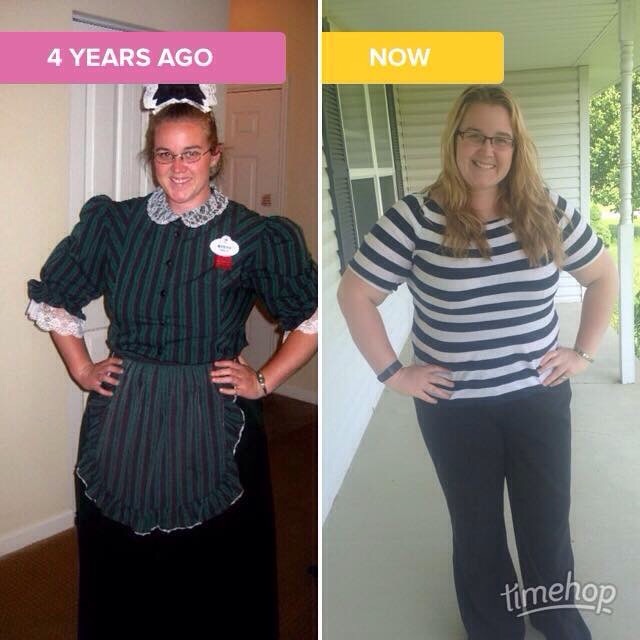 Four very long years ago I began day one training as the newest maid at Walt Disney World’s Haunted Mansion in Magic Kingdom. Sadly, today’s work attire isn’t as fun. But can I just point out how crazy it was that I chose to wear stripes?! It’s the little things in life that amuse me, what can I say?! What’s fun about the Haunted Mansion costume is the Bat Hat the girls get to wear! There’s a tradition at the mansion for each of the maids to have a specific name for their bat, and I would like you all to meet Mr. Chuckles. I miss that silly bat hat more than you’ll ever know – I really thought bubbly me was relocated to the wrong place when I moved from Disney Quest attractions to the Haunted Mansion, but when I put on the costume and secured that hat to my head I embodied this new persona and became the maid. Disney will forever be in my heart, even if I’m not wearing a bat on my head to work!